(Local swelling (Edema; serum inside abdomen; Ascites; swelling of the whole body; anasarca). Blood is made up of fluid called serum and the red and white corpuscles. Under certain circumstances, as in consequence of loss of blood from bleeding as during delivery, or of destruction of blood (as by malaria, Kala Azar, etc.) or from poverty of blood (as in dyspepsia, diarrhoea, diabetes, the last stage of almost all chronic disease) or of faulty action of the heart, kidneys or liver— the serum accumulates in different parts of the body. Arsenic 3, 12, 30—Used in all forms of dropsy—in anasarca due to heart-troubles or in dropsy due to liver troubles; patient is emaciated and weak; tongue red and rough; pulse irregular and small; extremities cold; constant thirst, relieved by sips; sense of constriction around chest; difficult breathing on lying down; yellow tint of skin; where serum is oozing and the skin is pasty looking with ulcers; much thirst or none at all. 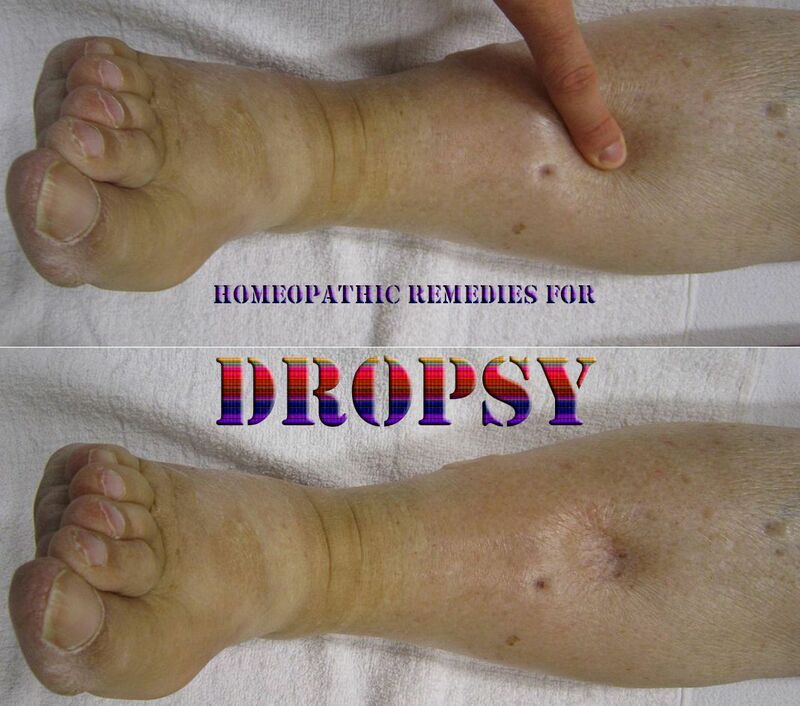 Decoction of Apocynum—15 to 20 drops twice daily in ascites. Apocynum 1x—Sense of heaviness of head; weakness; somnolence or restless sleep; slow pulse; constipation but stools are not hard; unconscious passage of urine; weak heart action; pain all over the front of chest and consequent heaving of sighs. Apis Mel. 3—Dropsy due to kidney troubles or to scarlet fever; oedema of lower extremities (especially in pregnant women); absence of thirst in acute cases of dropsy; delirium; vacant looks; gnashing of teeth; spasm or convulsion of one side of body; diminution of urine; sweating of the forehead; urine scanty and high coloured, brownish or smoke tinted. Digitalis 3—Pulse small, weak and intermittent; difficulty in breathing; dusky face; inability to lie on back; irregular action of heart; dropsy due to heart or kidney troubles. Acetic Acid 2x—Feet are much swollen and there is much thirst. Passes large quantities of pale urine. Terebinthina 3—Dropsy due to affection to kidneys, urine scanty, thick muddy sediment; dark, bloody and albuminous. Helleborus 12 or 30—Hydrocephalus—dropsy of the brain; general dropsy associated with or after some serious disease; cholera, eruptive fevers, inflammation of the kidneys, intermittent fever, debility, pains all over, diarrhoea, suppressed urine. Bryonia 3-30—Dropsy due to liver-troubles or constipation; swelling of the feet during pregnancy; dropsy due to suppression of sweating or disappearance of eruptions on the body; swelling of joints; difficulty of breathing; hacking cough; pain in the chest. Pulsatilla 6—Dropsy due to menstrual disturbance. Sulphur 30—Dropsy following suppression of any skin-lesion. Ferrum met. 6-30—Skin yellow or dusky; much prostration; constipation; nausea after eating; dropsy due to menstrual troubles. China 6, Lachesis 6, Colchicum 6, Lycopodium 30, Aconite 6 are occasionally useful. The patient should be kept comfortably in a dry and warm atmosphere; free and sufficient urination should be induced. He should have a sweating bath daily, To effect this last, wrap the whole body, from neck to feet, with two or three dry hot blankets, inside which half a dozen hot- water bottles have been inserted. Diet—Cut off salt from diet. Restrict fluid intake. Give plenty of milk, fruit-juices, rice, sago or barley gruel or pieces of dried arum (mun-kachu) boiled in milk. Avoid meat, spices, ata (flour). Give easily digestible nourishing diet; water should not be totally stopped; sufficient quantity of water may be given to allay thirst; drinking of water regulates the kidneys and helps towards proper elimination of urine.